I developed this fly after examining the stomachs of trout that were full of the red Dragon fly nymph. I took them home to copy about 10 years ago. Best time to use this is when you see the red Dragon fly around! Hook : Size 6 - 8. Body : Natural deer hair. Wing Case : Brown partridge. Legs : Brown partridge fibres. Eyes : Beads painted black. Head : Seal's fur dubbing. Spun natural deer hair - cut to the shape of a dragon fly nymph, making sure to trim the hair nearer to the hook on top. Then on top of the body, place small brown partridge hackles and varnish, so that they lay flat on the spun deer hair body. Longer brown partridge fibres wound 2 turns for legs. If eyes are required, use small bead chain painted black. The whole head is dubbed with seal's fur. 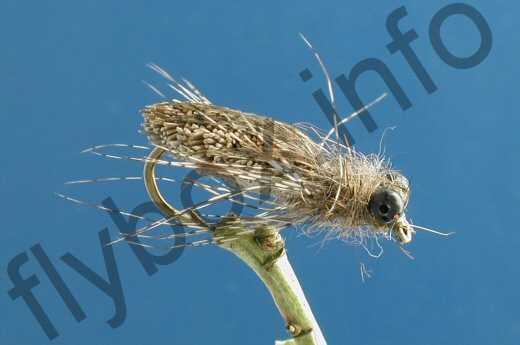 Currently there are no comments about the Small Deer Dragon Fly Nymph fly pattern from other fly fishermen yet.